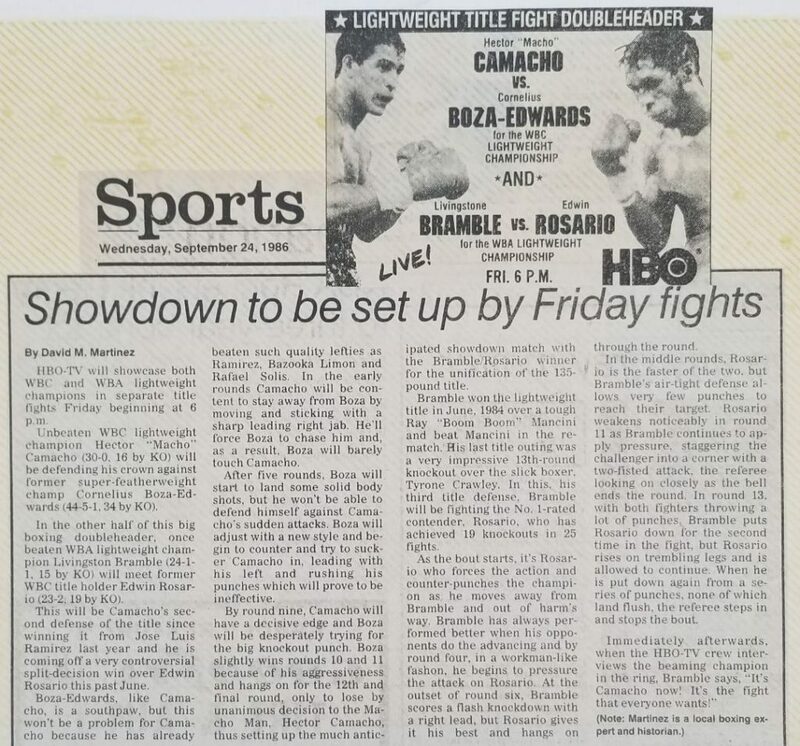 In this edition of “Pages From The Scrapbook” features my pre-fight article piece on Hector Camancho vs. Boza-Edwards / WBC Lightweight Championship and Livingstone Bramble vs. Edwin Rosario WBA Lightweight Championship – dated September 24, 1986. Many of my current fan base don’t know that back in the seventies, eighties, and nineties, I was a boxing beat writer for my local newspaper, the Santa Barbara News Press, doing fight predictions. I also frequently did guest commentary on local radio for all major fights. I learned quite a bit about the journalism field in those younger years that has truly helped me to be the best I can in producing dmboxing.com today. I am delighted to bring back some of these old article features for viewing. Macho was peaking and Boza was on the decline. Rosario really shocked Bramble and the world!